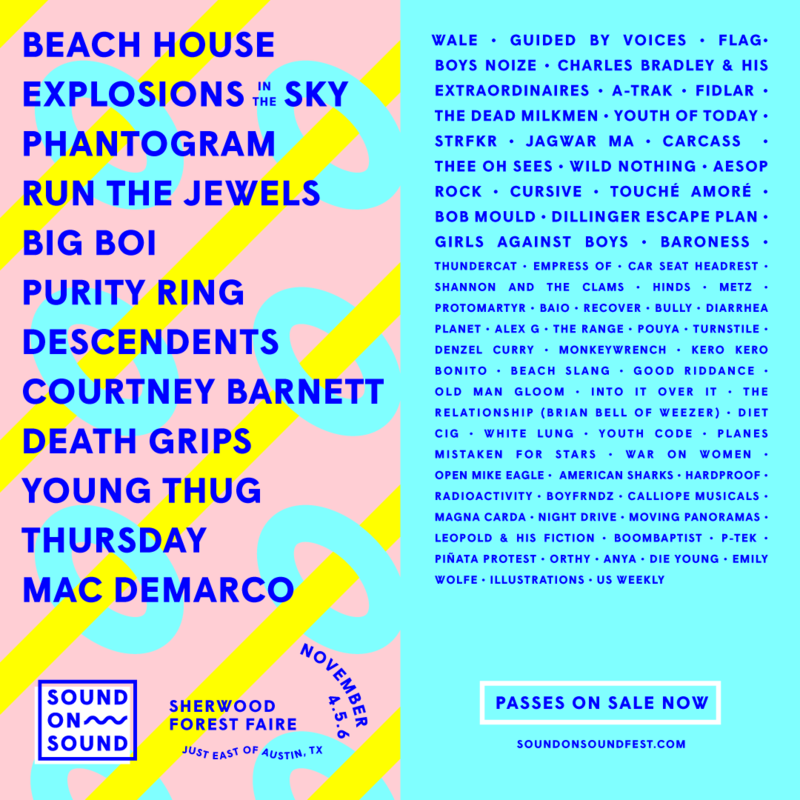 Sound on Sound is a new three-day festival taking place November 4th – 6th in Austin, Texas. The event reportedly replaces the long-running Fun Fun Fun Fest, whose future has been unclear ever since its promoters at Transmission Events split up earlier this year. The inaugural lineup boasts Run the Jewels, Death Grips, Descendents, Explosions in the Sky, Courtney Barnett, Beach House, Big Boi, Phantogram, Mac DeMarco, Guided By Voices, FLAG, The Dead Milkmen, Bob Mould, Charles Bradley & His Extraordinaires, Thundercat, FIDLAR, Thee Oh Sees, Car Seat Headrest, METZ, Baroness, Aesop Rock, Cursive, Hinds, Protomartyr, Diarrhea Planet, Into It. Over It., White Lung, Open Mike Eagle, Diet Cig, Bully, Denzel Curry, STRFKR, Jagwar Ma, Girls Against Boys, Empress Of, The Dillinger Escape Plan, Alex G, Beach Slang, and Monkeywrench, among others. Sound on Sound will take place in Sherwood Forest Faire, a 23-acre permanent renaissance village that features over 100 permanent buildings including shoppes, pubs, restaurants and stages, many of which will be utilized by the festival. Three-day general admission and VIP passes, including options for on-site camping, are available now.